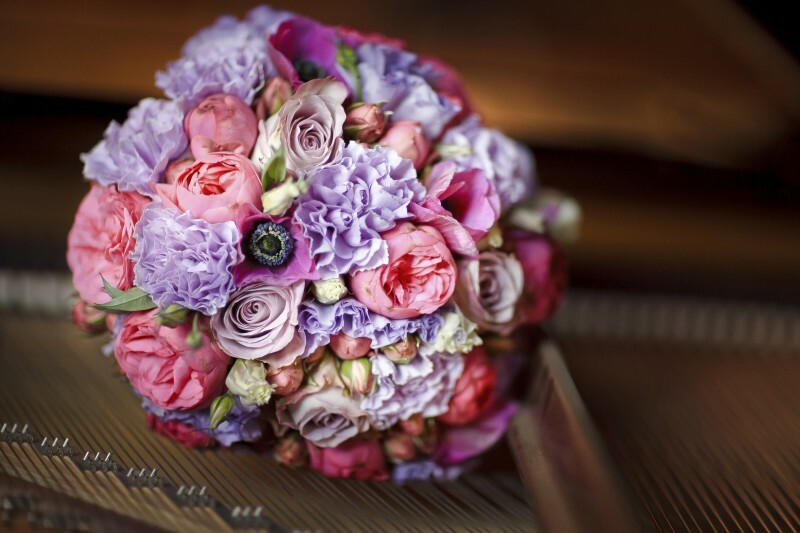 There are so many different options when it comes to bridal bouquet styles. Picking your bridal bouquet isn’t an easy thing to do and you might need to spend a bit of time going over all the different options. A nosegay bouquet is a shaped bouquet, consisting of a tightly packed group of blooms, which are all cut to the same length. The flower stems are wrapped with ribbon or another type of fabric, and the flowers often have a firm backing to give them structure. A hand tied bouquet, often referred to as a posy, is one of the most basic styles of bridal bouquet. As the name implies, it is a hand tied bunch of flowers with stems arranged together in an unstructured way, held together with a ribbon. Simple hand tied bouquets are fashionable, with many modern brides selecting just three or four long stemmed flowers. The composite bouquet is arranged by utilising hundreds of individual petals all wired together on one stem to create a look of a single large bloom. This can be an expensive bouquet but adds an elegant finish to your wedding bouquet. An uncommon choice for a bridal bouquet, the pomander is usually carried by the bridesmaids or flower girls. It is a sphere or ball of flowers held together by a loop of ribbon and is known as a kissing ball, which can be very romantic choice for a bride looking for an unusual bouquet. The cascade or shower is quite a traditional and elegant form of bouquet. The flowers are arranged to look as if they are floating over the brides hands and down towards the ground. Traditionally these bouquets were quite big, but there are smaller contemporary versions known as teardrop or trail bouquets. 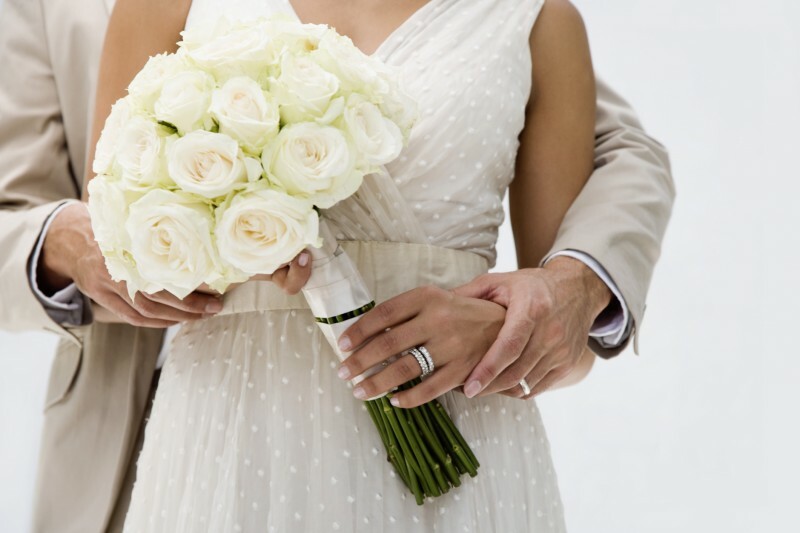 For something different, the presentation, or arm sheath bouquet can be used instead of traditional bouquet shapes. The bride cradles a number of long stemmed flowers such as calla lilies, long-stemmed roses, or delphiniums in her arms in the style of an actress showered with flowers at the end of a performance. A tussy mussy bouquet is just a nosegay style bouquet arranged in a small vase (or tussy mussy) made from china, silver, or other such material that works with your wedding theme. Some tussy mussy bouquets include a small chain with which to carry them. This style of bouquet is easy to display during the wedding reception, and the vases can be used as thank you gifts for your bridesmaids. A fan bouquet is lovely for a vintage style wedding, and comes with a simple plastic fan entwined with blooms and greenery. This provides the bouquet with a very unusual shape, and it stands out as quite unique from classic bridal bouquets. The Biedermeier bouquet gets its name from a type of interior design and is similar to a nosegay in shape. Unlike a nosegay the flowers are organised in tight circles of contrasting colours to add a different effect. Basket bouquets are great for flower girls and young bridesmaids as they are simpler to carry than hand tied bouquets or nosegays. The basket bouquet is a fashionable choice for outdoor or garden weddings, mainly because of its rustic charm, as well as because the flowers can be organised in oasis inside the basket so they won’t wither as quickly as with other styles of bouquet.